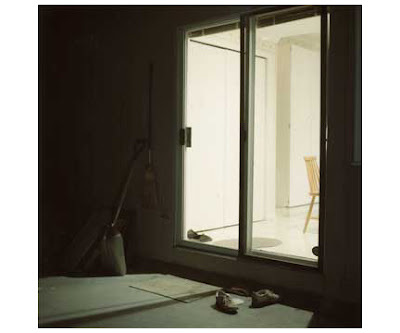 with her beautiful melancholy imagery, lit mainly with natural light, and comprised mainly of soft fields of color, karin bubas creates a very painterly set of images with her daytime work reminding me at times of vermeer and her exterior studies at night (example below) recalling the work of edward hopper. the above images come from my personal favorite of her series', ivy house, in which she photographed a victorian era home in london. the pictures exalt the feminine details associated with that era like the floral wall paper and lace and also the many ornate details of the house that gave it character. her subject matter from series to series varies quite a bit, but all her work seems to revolve around the idea of lonliness and the relationship between individuals and their environment, whether those individuals appear in the photographs or not. she explains "pictures of one’s home and private life seem far removed from pictures of well-dressed women standing alone in picturesque landscapes. however both approaches play on photography’s ability to tell a story through a single image or series of images. the story is never completely clear but the pieces are presented for the viewer to fill in the gaps." 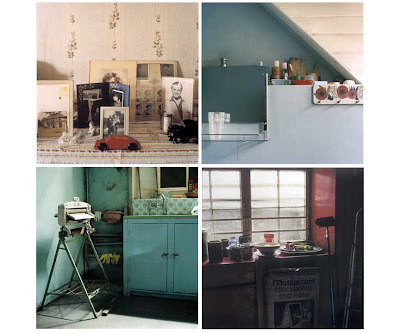 karin sites inlfunces like jeff wall and justine kurland but i also see eggelston in her images, but maybe that's because these images are such a nod to formal photography that they naturally enter into a dialogue with the great color photographers. i can see any lover of the medium finding something they like in her images. you can find a brief interview with karin at poppy talk and i highly reccommend reading the bio on her site.